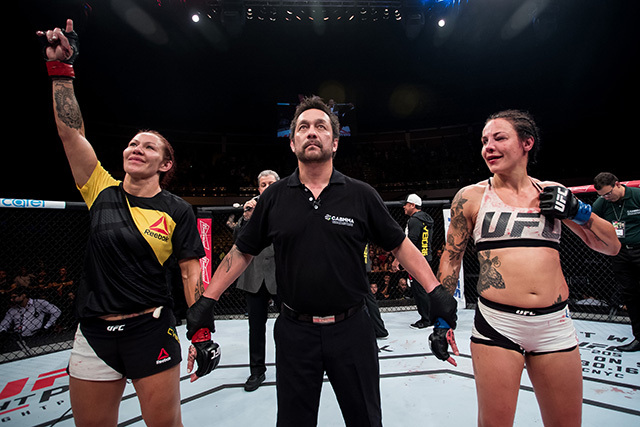 “It would be easy to say something pseudo-clever like “death, taxes and Cyborg by TKO,” but after Cristiane Justino’s 12th straight bout ended before the final bell, it seems like dodging taxes and cheating death might be easier than surviving a title fight with the best female fighter on the planet. “Cyborg” violence has become an inevitability: Her knockout streak is coming up on eight years, and in her 17 career wins, she has only needed the judges to notarize the outcome twice. I’m not sure what the creator of that was really going for. I suppose he or she was trying to alter the maddening experience of being forced into what is essentially a game of politically correct bumper cars where you want to smash into the person in front of you but can’t. However, instead of thinking “whoa” and feeling my impatience dissolve into the vibrations of the universe, all it did was magnify the fact that there were no other options but to tackle traffic, day in and day out. It’s tantamount to telling Sisyphus that he was doing it all wrong: “The secret is to be the rock.” Yes, visualize, breathe deep and become your own futility. There’s a lesson here for Michael Johnson. The Blackzilians lightweight snapped a two-fight skid by completely flattening Dustin Poirier in 95 seconds at UFC Fight Night 94 on Saturday in Hidalgo, Texas. In doing so, he announced not only a return to form but also a return to the top shelf at 155 pounds. 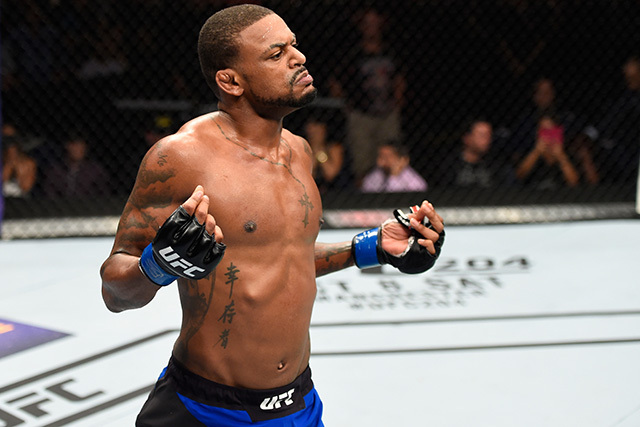 Prior to losing back-to-back fights to Beneil Dariush and Nate Diaz, Johnson had all the looks of a serious contender in a division in no short supply of serious contenders. Now, “The Menace” is right back in the mix. It was a big win. “When we break down the purpose of organized competition into its most basic parts, past the platitudes of fun and entertainment, we get a glimpse into the human psyche. Sports — both participating and watching — are indeed fun and entertaining, mostly because we all understand that such physical feats are really, really difficult. Somewhere in the heart of man there is a relentless curiosity to know the limits of our species. A core part of all of us wants to see a concrete demarcation of what those limits are even though they rarely have much to do with our own personal limitations, which tend to be pretty unimpressive in the grand scheme of things. It’s why we idolize and admire great people: They show us what can be done while simultaneously making us wonder how they did it. The visual aesthetic of greatness is only part of it; actually seeing the best is obviously great, but we also want to simply know. Competition is a mechanism of exploration. The appeal of heavyweight fighters is as pure a distillation of this dynamic as there is in sports. In the name of fair play, fighting has been broken down into weight divisions, each champion representing the best fighter in a particular range of size. However, if we were to exist in the world as it just is, it would stand to reason that the biggest best fighter would simply be the best fighter. It’s what we expect of our heavyweight champions and why we tend to label them the “Baddest Men on the Planet.” The heavyweight champ is supposed to be the last one standing if every single person in the world fought in a tournament. Theoretically, the heavyweight division should compose the majority of the final few rounds. “The Ultimate Fighting Championship heavyweight title has not been kind to the home team lately. Cain Velasquez lost his championship to Fabricio Werdum in front of a supportive Mexico City crowd; Werdum, in turn, lost it to Stipe Miocic in front of his Brazilian countrymen. 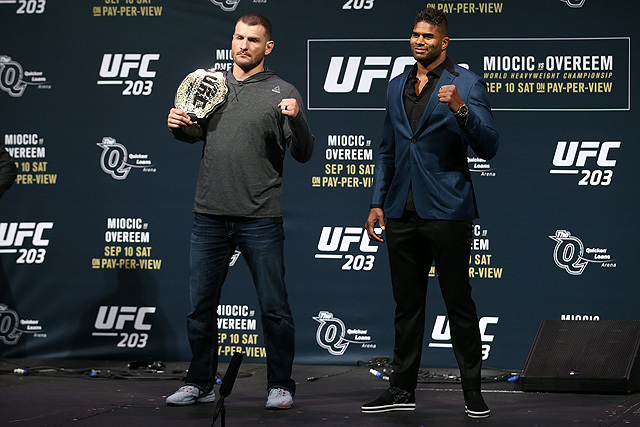 Miocic will now try to buck the trend by defending his belt for the first time in his hometown of Cleveland, where he faces Alistair Overeem on Saturday in the UFC 203 main event. Miocic has fought a combined 3:41 in his two fights this year. This will be his third fight of 2016 and the fifth straight bout in which he fights a former champion of some sort. Standing opposite the defending champ will be Overeem, a longtime MMA veteran who has fought in virtually every major promotion during the course of his career. Overeem has undergone a recent career resurgence following a shaky start in the UFC. The former K-1, Dream and Strikeforce champion went 2-3 in his first five UFC fights, but he has since reeled off four straight wins, three of which came by knockout or technical knockout. This will be his second fight of 2016 and the fourth consecutive bout against a champion or former champion.